Creative Commons, Attribution NonCommercial 4.0 International (CC BY-NC 4.0) license. 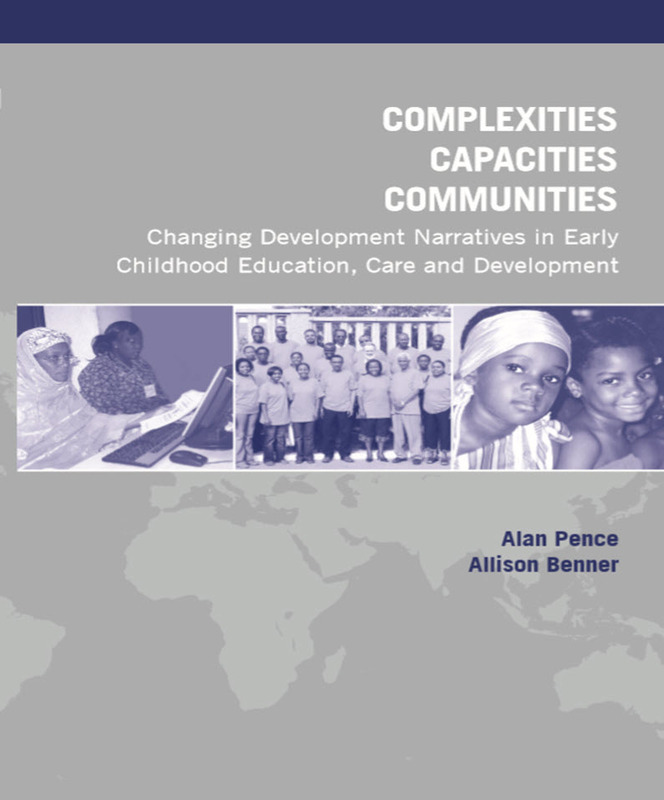 Complexities, capacities, communities: changing development narrativesin early childhood education, care and development / Alan Pence and Allison Benner; with chapter contributions by: Fortidas Bakuza & Clarence Mwinuka, and Foster Kholowa & Francis Chalamanda. Includes bibliographical references and index. Issued in print and electronic formats. 1. Child development. 2. Early childhood education. 3. Child care. I. Benner, Allison, author II. Title. This publication is licensed under a Creative Commons, Attribution NonCommercial 4.0 International (CC BY-NC 4.0) license. This license allows anyone to share and adapt the work for non-commercial purposes provided that appropriate attribution is given, and that in the event of reuse or distribution, the terms of the license are made clear. To obtain permissions for uses beyond those outlined in the Creative Commons license, please contact Alan Pence at apence@uvic.ca. This book is dedicated to the memory of Dr. Jean Cyril Dalais— a tireless and eloquent advocate for the children of Africa. Alan Pence is UNESCO Chair for Early Childhood Education, Care and Development and Professor, School of Child and Youth Care, University of Victoria. He is the recipient of the International Education Leadership Award from the Canadian Bureau for International Education, the University of Victoria’s inaugural Craigdarroch Research Award for “societal benefit”, and a finalist for the World Innovation Summit for Education (WISE) Award. Dr. Pence is the founder of the First Nations Partnerships Program, an indigenous, community-based education and development program, and the Early Childhood Development Virtual University (ECDVU) an ECD capacity promoting program active in Africa since 2001. The author of over 130 articles and chapters, two of his books that relate closely to this volume are Supporting Indigenous Children’s Development (with Ball, 2006), and Africa’s Future - Africa’s Challenge: Early Childhood Care and Development in Sub-Saharan Africa (edited with Garcia and Evans, 2008). Allison Benner has over 20 years’ experience as a writer, researcher, instructor, and curriculum designer in linguistics and early childhood. Her work includes studies of first language acquisition across cultures, child care and early learning policies and programs, and capacity-building and experiential learning in post- secondary education. Over the past two decades, Dr. Benner has collaborated with Dr. Pence on many capacity-promoting initiatives in the early childhood field, including writing and curriculum projects for the First Nations Partnership Programs and the Early Childhood Development Virtual University. There is perhaps no more delicate a topic for discussion than what is ‘best’ for children—a discussion confounded by the singularity of ‘best’ and the diversity of ‘children.’ In the Western (minority) world certain beliefs about children and their care are presented as ‘universal’, but the global evidence to support such claims is often lacking. Increasingly, leading ‘Western’ journals are publishing challenges to such assertions. The October 2008 edition of American Psychologist published an article by Jeffrey Arnett entitled “The neglected 95%: Why American psychology needs to become less American”. In that article Arnett notes: “I argue that research on the whole of humanity is necessary for creating a science that truly represents the whole of humanity….American psychology can no longer afford to neglect 95% of the world…” (p. 602). In 2010, Henrich, Heine and Norenzayan published an article in Behavioral and Brain Sciences entitled: “The Weirdest people in the world?”, making the case that samples drawn from “Western, Educated, Industrialized, Rich, and Democratic (WEIRD) societies…are particularly unusual compared with the rest of the species—frequent outliers.…The findings suggest that members of WEIRD societies, including young children, are among the least representative populations one could find for generalizing about behavior…” (p. 1). Clearly, the West’s perspective is not the full story; it does not represent “all of humanity”. There are other understandings regarding children and their care and these ‘other ways’ have also produced adults of outstanding ability, character, and accomplishment—but we know relatively little about them. This is a book that focuses on ‘other ways’: other ways of understanding children’s care and development; other ways of supporting ‘communities’ from local to country levels; other ways of promoting capacity; and other ways that scholars and tertiary institutions can contribute to children’s and societies’ well-being. It is a book that moves beyond a place of hegemonic ‘universals,’ to an inclusionary and multi-faceted place of diverse global understandings. It is a place beyond knowledge—it is a welcoming and interactive place of many knowledges. Finding the place was accidental—it was not planned. It began with a phone call in 1989 from the Executive Director of an Indigenous tribal council in north- central Canada, far removed from my (Pence’s) office at the University of Victoria on the west coast of Canada. The Executive Director wished to meet with me to discuss an ‘other’ way of undertaking post-secondary education on-reserve with their nine First Nations communities. We met; I was impressed by his energy, commitment and vision; and this story began. The story continues today, a quarter-century later. However, its primary location is no longer in north-central Canada, but in sub-Saharan Africa. How the tribal villages and boreal forests of central Canada connect with the savannahs and cities of Africa is the subject of this book. And that journey is placed into a context of theories of child development, community development, and international development that are too seldom critiqued, and whose power has suppressed local understandings, local values, and local knowledge to the detriment not only of those communities, but all peoples of the world. In ways not dissimilar to humanity’s loss of bio-diversity, we are similarly deprived by our loss of ethno-diversity. The approach taken in this volume requires a suspension of established development narratives—at individual, community, and international levels. Such narratives require an allegiance to a particular pathway, a ‘best way’ understanding of ‘development’; yet human and social diversity reflects a complexity of many possibilities, perhaps most especially where the care of children is involved. This volume provides examples that are predicated on multiple knowledges and ‘many good ways,’ rather than the singularity of ‘best.’ These approaches not only open up to diversity, they require it. Without ‘the other’ there can be no way of seeing differently, of comparing, of thinking beyond one’s self or one’s group—and to educate ‘the other’ to see only one’s own way, deprives both. Power and fear have operated in tandem, on both sides of power imbalances, to restrict possibilities—the ‘power-to-do’ and the ‘fear-of’ have restrained the pursuit of alternatives and all that could be learned from them. The term ‘development’ has been a means to address such fear, to define a ‘normal,’ a ‘desirable,’ or an expected progression, and also a means to address unpredictability. It is a term more palatable to contemporary minds than colonization; however, its impact has often been the same—to tame and control the world, to bring it into conformity with a plan that serves those with power. The generative curriculum took it as a given that there are multiple knowledges—that Western science is one such knowledge, but there are many others, including local, indigenous knowledges. The generative approach also recognized that ‘knowledge holders’ come in many different forms—as respected academics with many years of formal education, but also as Elders with many years of experience, known and trusted in the community, and also as new parents, young childcare workers, and the children themselves. The generative curriculum appreciated the strengths that exist in communities and that one does not ‘build’ capacity so much as nurture its growth. Capacity promotion is as much about stepping back, as stepping in. The successes of the generative approach were recognized by an ECD leader in UNICEF Headquarters in 1994, Dr. Cyril Dalais, and he wanted to use it to support UNICEF’s work in sub-Saharan Africa (SSA). This book is primarily about this second phase—the SSA phase—of generative work now entering its third decade. It is a reflection not only on the programs and activities that have been pursued, but also a contemplation of why seemingly simple understandings, such as an appreciation of multiple knowledges, diversity of knowledge holders, building on strengths, and the impossibility of ‘best’ in a world of diversity, continue to be largely absent in international development work. The volume begins with two chapters that provide critiques that set the stage for this volume: chapter 1 is a critique of the term ‘capacity building’ and chapter 2 is a critique of what has been named the ‘science of ECD.’ These chapters help clarify what is often not apparent in international ECD activities—the dark, or problematic, side of ‘good work.’ In early childhood work, and in development work more generally, individuals and organizations are often blinded by their good intentions, believing perhaps that good intentions are enough. They are not. Such intentions should not be assumed to operate beyond a world of power dynamics and competing visions of what is ‘good.’ The fact that a certain understanding of the world is claimed by a powerful group or society, and validated by techniques it honours, makes it neither ‘right’ nor ‘best.’ While notions of ‘right’ or ‘best’ are often useful to consider, a dynamic of multi-faceted consideration should guide their exploration. These principles of ‘consideration’ guided work with tribal organizations from 1989 on—various knowledge holders introduced various conceptions of ‘good’ to program participants, and as the participants themselves met and interacted with those ideas, drawing on their own knowledge and experience, new possibilities were generated. Chapter 3 describes the First Nations Partnerships Programs (FNPP) and provides a background for the programs that followed it in SSA. Overviews of three SSA programs are included in chapter 4: the ECD Seminars held in SSA in the late 1990s; an African International ECD Conference series held from 1999 to 2009; and the Early Childhood Development Virtual University (ECDVU), launched in 2000/2001 and continuing to the present. The ECDVU is the major focus for chapters 5-8. Chapter 5 describes in some detail the operationalization of ECDVU and chapter 6 presents findings from evaluations of its broader capacity-promoting purpose. Chapters 7 and 8 provide country case examples focused on Tanzania and Malawi, respectively, authored by ECDVU graduates (Tanzania: Fortidas Bakuza & Clarence Mwinuka; Malawi: Foster Kholowa & Francis Chalamanda). The book concludes with chapter 9, which looks at extensions of the earlier work, with particular focus on the importance of SSA post-secondary institutions’ leadership for ECD, both through coursework and programs that dovetail with various local initiatives and through African-led research and scholarly work. All facets of ECD in Africa, from civil society through government, from local communities through tertiary education, must seek to create webs of synergistic interaction that support, complement, and advance ECD and children’s well-being. Arnett, J. J. (2008). The neglected 95%: Why American psychology needs to become less American. American Psychologist, 63, 602–614. Henrich, J., Heine, S. J., Norenzayan, A. (2010). The weirdest people in the world? Behavioral and Brain Sciences, 33(2/3), 1-75.